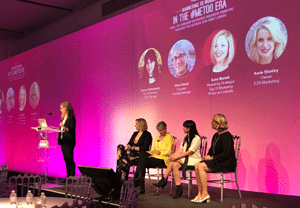 More than 100 marketers gathered at Espace in Manhattan on June 19 for the morning workshop “Marketing to Women in the #MeToo Era,” ahead of Chief Marketer’s 2018 PRO Awards gala luncheon. The half-day program featured seven sessions and 14 speakers who weighed in on creating thoughtful marketing programs that resonate with today’s women and navigating the current climate with the kind of authenticity and transparency in demand. Kicking off the program was a panel discussion on “15 Brands Getting It Right—Right Now,” featuring Katie Martell, marketing strategist and Top 10 marketing writer on LinkedIn; Gina Glantz, founder of Gender Avenger; Tamara Bohorquez, vp-planning at FCB Chicago; and Amie Stanley, owner at E29 Marketing. The group deconstructed 15 campaigns that leveraged a message for women. A few highlights from their discussion: “It’s one of the great things the #MeToo movement has done—wake everybody up, including women,” Stanley said. 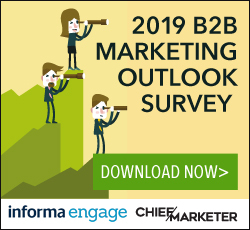 “As you market and think of the sponsorship that your clients offer… making sure the sensitivity of the balance of speakers is important,” Glantz said. Next, Andrea Van Dam, ceo at Women’s Marketing, Inc., offered fresh insights and data on what’s driving women to buy and love brands today in “What Women Want—Really.” At the heart of successful marketing to women are emotional connections, clear benefits and convenience. If ever there was a brand that has navigated historical marketing evolutions, it’s JCPenney. Marci Grebstein, cmo of the 113-year-old brand, explained the creation and execution of the retailer’s new “Style and Value for All” campaign. Grebstein explained the campaign’s messages of inclusion, the golden rule messaging that the brand was founded on; how the campaign maps back to the brand’s history and story, and why inclusion, across ethnicity, gender and body diversity, and family—however you define it—is at the heart of its marketing. For JCPenney and Grebstein, brands and marketers have to evolve as quickly as the world is changing around them. “It’s really that whole body listening: it’s observing with your eyes, hearing with your ears, thinking with your head, but most importantly, it’s connecting with your heart,” Grebstein said. Attendees then stepped inside Belvedere Vodka’s A Beautiful Future campaign and how it leveraged a partnership with musical artist Janelle Monáe to fuel content and live experiences that advance awareness, inclusion and opportunities for women and those who identify as women. Speakers included Anu Rao, global director-communications at Belvedere Vodka and Marie Kelly, VP, account director, at Jack Morton Worldwide. Next up: “How to Create a Company Culture that Supports Women.” Kristi Faulkner, president at Womenkind and Jose Zeilstra, ceo at Gender Fair, discussed why authenticity is a brand’s most important asset and reviewed “feminist” ad spots, comparing the brand’s messaging to how they treat their employees in reality. A key stat: 84 percent of Americans say they expect companies to support women’s rights. “Only 15 percent of companies are gender-fair based on research—but pretend to be feminists in their marketing… We’re creating a massive disservice to ourselves and the [#MeToo] movement by letting this go on,” Faulkner said. The day wrapped with a power panel on “Putting Intentions into Action,” which covered, among topics, real steps organizations can take to follow the insights discussed throughout the workshop. Panelists included Bruce Henderson, global chief creative officer at Jack Morton Worldwide; Donnalyn Smith, president, North America, Momentum Worldwide; Lauren Elliott, svp-director of strategy, Badger & Winters, and Clark Fisher, vp-group creative director, Badger & Winters. Smith discussed how her company ensures “our talent slate has a mix of candidates,” and puts programs in place centered on succession planning, that maps paths for every employee. On authenticity: “It’s about going back to where your brand is rooted,” Elliott said.